It’s easy to forget that there was a time before Bootstrap - a time when web developers had to painstakingly set up their own grids and rules for styling. When Bootstrap came along, it made developers so much more productive. In just a few seconds you could spin up a decent looking user interface and then get back to writing valuable application logic. Today, Salesforce developers are lucky because there is an even more tailored version of Bootstrap for Salesforce that allows Salesforce devs build user interfaces and experiences which are consistent with the Salesforce design aesthetic. It’s called the Salesforce Lightning Design System. It was built by Salesforce UX. More importantly, it continues to be maintained by Salesforce UX. This means that whenever the Salesforce platform goes through UI updates or changes, you can rest assured that your app will automatically continue to remain aesthetically compatible. The Lightning Design System is hosted on GitHub and is open source so you can contribute back to it. It can be used with Lightning, Salesforce1, Visualforce, and Heroku. 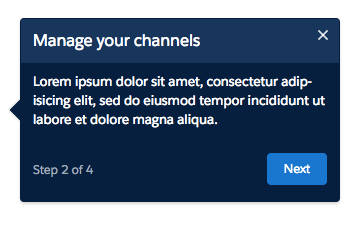 We even use it for our main user interface for Blue Canvas. There are four main design principles behind the Lightning Design System: clarity, beauty, efficiency and consistency. Just like Bootstrap, the Lightning Design System provides cross-browser compatible CSS, icons, font and design guidelines, and semantic and accessible component markup. It even has it’s own typography known as Salesforce Sans. 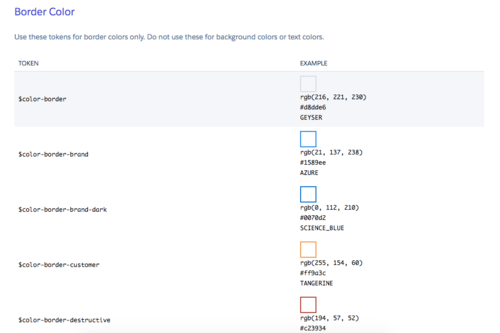 The design system also offers a list of background colors and text colors and font sizes to use. Ever wanted to make a dashboard or steam of events in a way that looked the way that the Salesforce dashboard does? You can do that with the Activity Timeline component. You can then include various next action items for a user like a Call, Email, Event or Task. 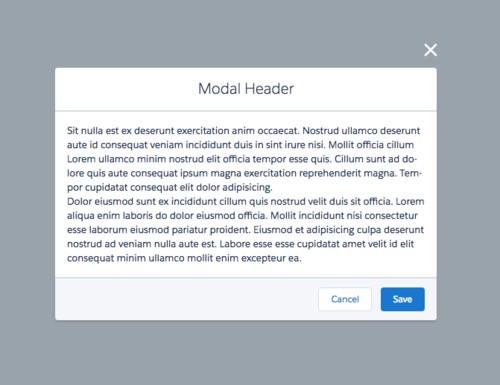 Salesforce provides pre-built modals that you can use to provide important information to your users. 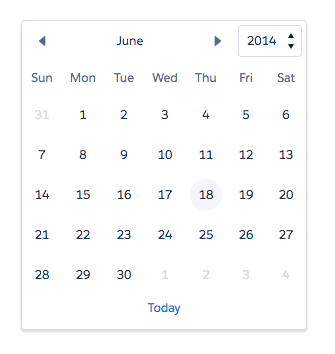 How many times have you fiddled with clunky date-pickers only to wish there was an easier way to make it look and perform better? 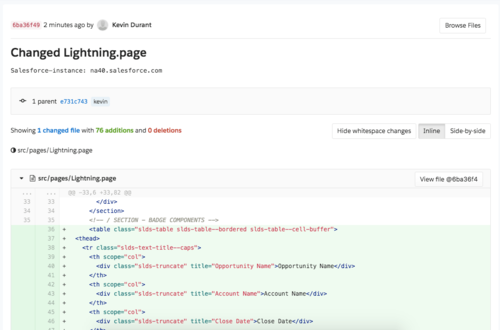 The Salesforce Lightning Design system has you covered. The Lightning Design system is about more than color schemes and typefaces. It is about freeing you to create great applications with great users experiences. The Walkthrough component is a great example of this as it allows you to build a better onboarding, product announcement and training experience for new users. One of the toughest things for any designer is ensuring that your app design stays consistent and scalable. The more you build, the more complex your design becomes. And if you’ve just hardcoded values throughout your CSS making updates and changes is going to painful. Plus, if Salesforce makes changes to their UI, you will have to manually ensure that everything gets update. Design tokens are the answer to this problem. They are “named entities that store visual design attributes.” You can use them instead of hard-coded pixel values or hex values. And it’s not just background color, but also line-height, spacing, opacity, font, font-size, z-index and more. Now click Quick Save and Preview. You should now see the Lightning Design System styled table. Note, if you go to your Blue Canvas dashboard, you will see how Blue Canvas automatically picks this change up and commits it into Git history. So now you have have a full backup and Salesforce audit trail for what specifically has changed about this code over time. This is useful if you ever need to rollback or do a compliance audit. The Lightning Design System is a great way to scale out your design so that it’s easier to maintain, while also ensuring that you are always complying with best practices and Salesforce design aesthetics. It allows you to save a lot of time and headache. 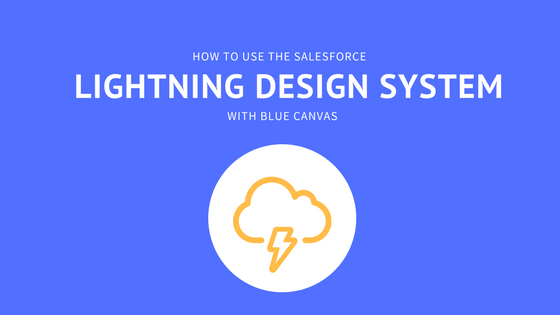 We use the Lightning Design System at Blue Canvas and recommend it to all developers working on Salesforce applications. 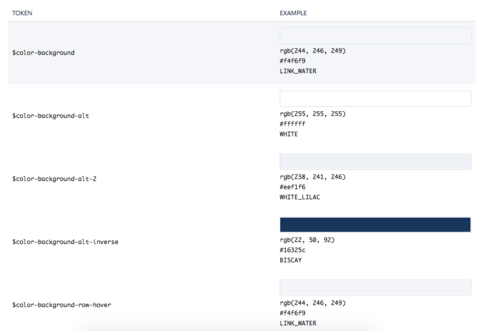 We also recommend that you get your Lightning Design System code under source control so that you can keep track of how your design is changing over time and rollback to previous states as needed.